My son loved his Chicken and Spinach Alfredo Pizza for his birthday and I found that it is just as delicious as a Calzone. My family loves Calzones. Usually I vary the filling by request – classic pepperoni, olive and cheese, or Hawaiian. It is a lot like pizza in that you can customize what your family likes. Prepare the dough: Place 1 cup warm water in the bottom of your mixing bowl (I use my Kitchen Aid). Add yeast and sugar. Stir. Add 2 tablespoons of canola oil, 1 cup of flour, and 1 teaspoon of salt. Stir until combined. Add remaining 2 cups of flour. Use the knead attachment and knead the dough until it is smooth and elastic. Add about 1 teaspoon of canola oil and coat the dough ball with it. Cover the dough with plastic wrap and then a towel and allow to rise about 30 minutes. Divide the risen dough into 6 equal size portions. On a floured board roll out each individual portion of dough into about 6 to 8 inches in diameter. Place 2 tablespoons of Alfredo sauce on one half of the dough, leaving about 1/2 inch dough along edge exposed. Top with about a tablespoon of spinach, spreading it out over the Alfredo. Place about 1/2 cup of shredded rotisserie chicken on top of the sauce. Drizzle about 1 tablespoon of additional Alfredo Sauce over the chicken. Sprinkle the top with 1/4 cup of shredded cheese. Carefully fold the portion of dough that does not have topping over the filling and seal the edge with the exposed edge that the filling is on. Press down gently to ensure a good seal. Transfer the calzone to a parchment (or silicone) lined baking sheet. Repeat with remaining dough portions. I can fit 3 or 4 calzones on a baking sheet. I rotate the baking sheets in the oven at the half way point to ensure even baking. Allow the calzones to rest about 15 minutes before baking. Just before baking, Beat the egg in a small bowl with about 2 tablespoons of water. Brush the calzones with the egg wash with a pastry brush. Bake for 20-25 minutes, rotating the baking pans half way through cooking. 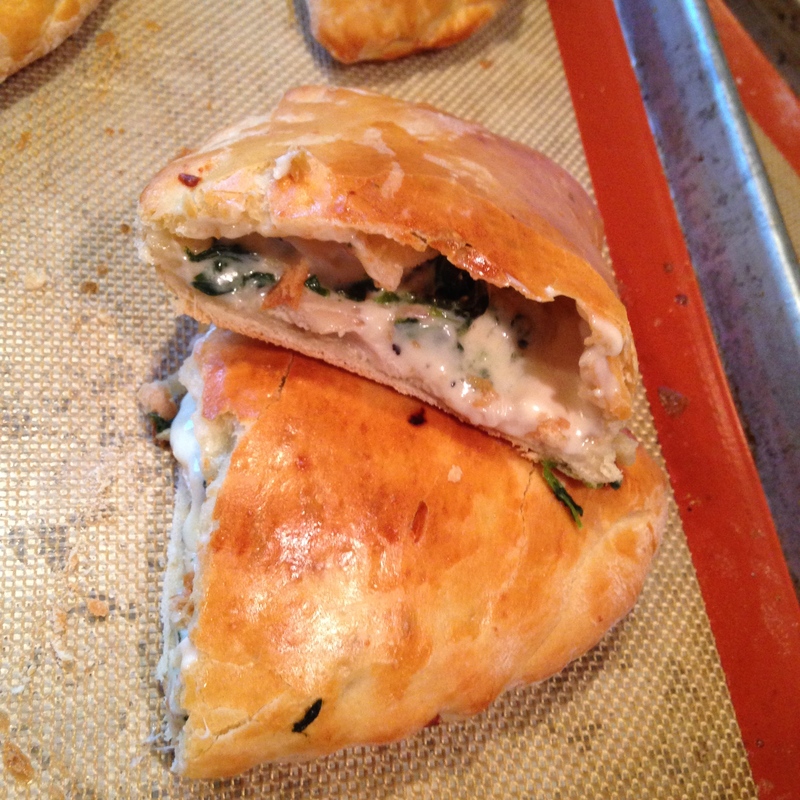 Allow the calzones to cool about 15 minutes before consuming the filling will be very hot! Categories: Ethnic, Ethnic - Italian | Tags: Calzones, Chicken and Spinach Alfredo Calzones | Permalink. 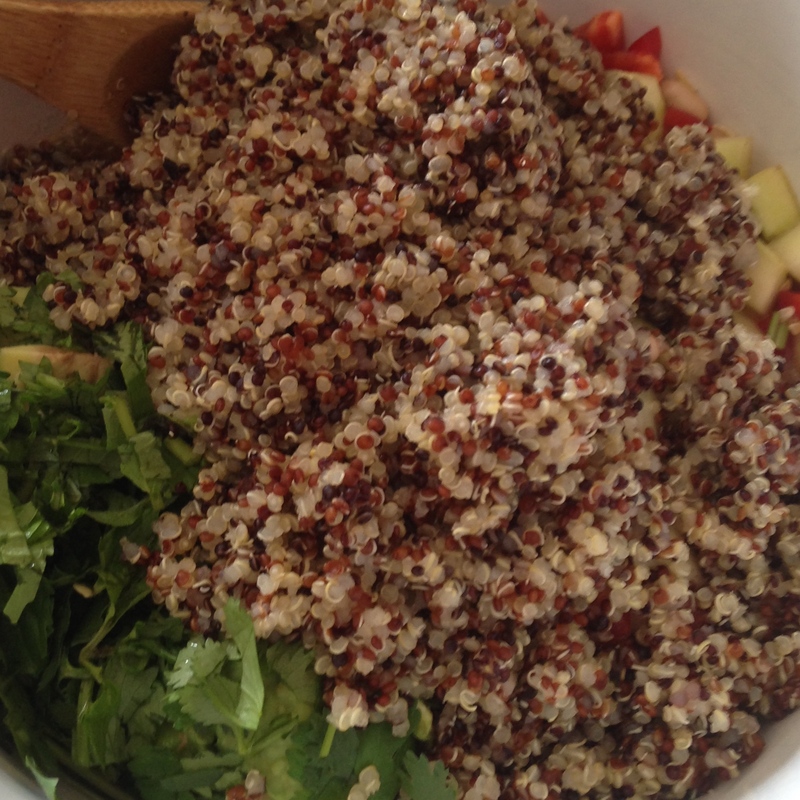 Prepare the quinoa according to package directions and cool. Prepare the dressing, coming the dressing ingredients in a bowl and whisk to combine. Adjust the honey to your personal preference. Combine the salad ingredients and pour the dressing over the salad. Serve cold or at room temperature. 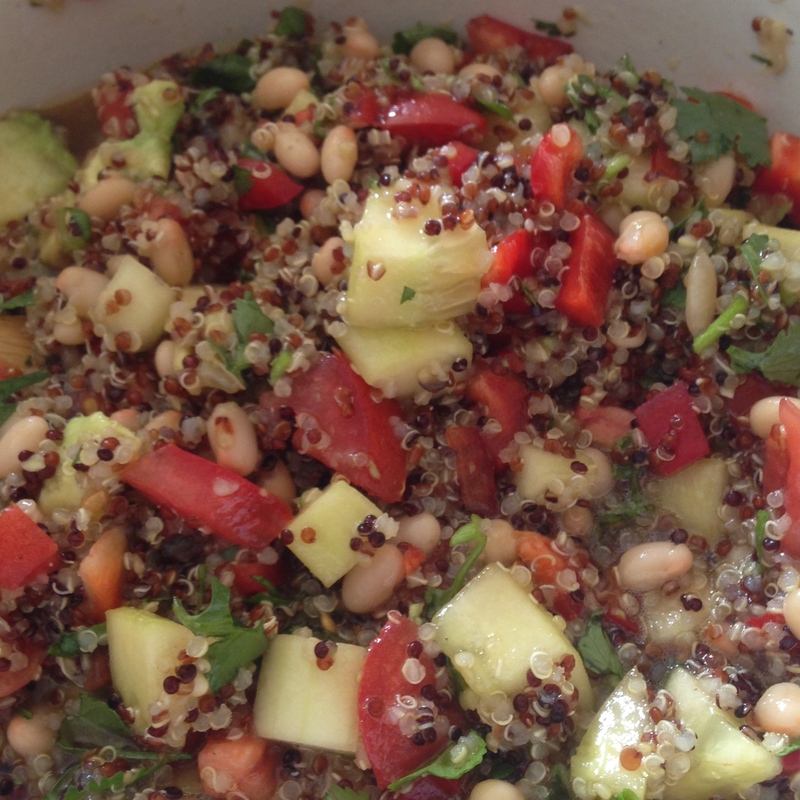 Categories: Gluten Free (GF), Side Dish - Salad, Side Dishes, Vegetarian | Tags: Bob's Red Mill Tri Color Quinoa, Healthy Salad, Quinoa Salad, Vegetable Bounty Quinoa Salad | Permalink.